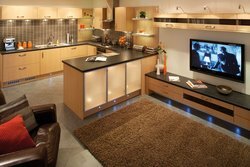 Kitchens by Choice is a showroom based in South Manchester providing a wide range of Kitchens ranging from the Traditional to Modern to Contemporary designs. We offer the complete service which means everything tiling, plumbing, electrics, Gas safe gas fitter, floor tiling, decorating your kitchen (painting). We can also carry out any building work minor or major. We offer a free plan and design service with survey included with absolutely no obligation. We also offer a supply only service, it works by rob carrying out an on site survey to measure, customer chooses doors etc and it is delivered on a supply only.